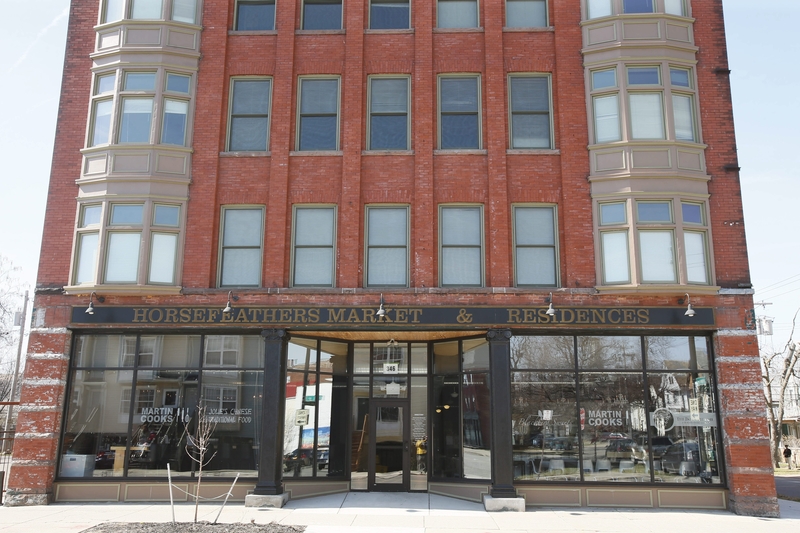 The Horsefeathers Market and Residences was passed up by other lenders. Evans Bank is finding new opportunities in old properties. During the past year, the Hamburg-based bank financed the renovation of the Houk Lofts on Grote Street, the Buffalo Iron Works bar and restaurant in the Cobblestone District, the Horsefeathers Building on Connecticut Street, and the Martin Group’s new home on Main Street. All of them are in the city of Buffalo. Evans is getting that business by drawing on its experience in commercial real estate lending, and has bolstered its team in commercial and industrial lending, “so we’ve gotten some opportunities that we previously wouldn’t have gotten,” said David J. Nasca, president and chief executive officer of Evans Bancorp. Nasca, who spoke at Evans’ annual shareholders meeting on Thursday in Orchard Park, said the bank is supporting more revitalization projects this year. The bank is financing the acquisition and renovation of a former Walmart store in Orchard Park that houses the main operations of Worldwide Glove, which sells gloves and safety apparel. It is also financing Riverworks, a former office building, warehouse and grain mill being turned into an entertainment complex, and the conversion of the Lafayette Presbyterian Church in the Elmwood Village into a mix of worship space, commercial tenancy, community kitchen, meeting rooms and 21 apartments. “These types of projects also prove that our capabilities on the commercial side are on par with the most sophisticated banks in the community,” said Gary A. Kajtoch, executive vice president and chief financial officer. Is taking on older buildings for revitalization a riskier proposition for Evans than financing something brand new? And Nasca noted there is diversity within the rehabilitation projects, for purposes from businesses and entertainment to living space. Nasca said Evans often gets “a lot of the tougher projects from some of the developers, because we can take the time. They’re not the biggest ones always.” Some other lenders passed on the Horsefeathers project before Evans took it on, he said. In his remarks to shareholders, Nasca said this year is shaping up to be “a difficult and uneven environment for banking institutions,” citing the interest rate environment and formidable local competition. Nasca sees more opportunity for Evans: while the bank has grown significantly in recent years, it still has only 2 percent of the deposit market share in the region. As of the end of the first quarter, it had deposits of $722 million. To reach a 3 percent share, Evans would have to grow its deposits to the $930 million range, which would be an increase of about 29 percent. “It’s not insignificant to move 1 (percentage point),” he said.